Horbury Property Services, part of the Horbury Group based in Rotherham, is celebrating its success in becoming part of a framework agreement with Coventry City Council. 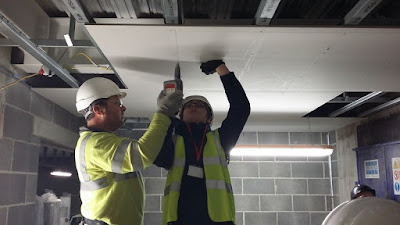 The Horbury Property Services subsidiary is now one of the approved providers of ceilings and dry wall partitioning services for Coventry Council's public buildings including schools, academies, leisure centres and commercial offices and retail units. The Framework went live in October 2017 and is for a maximum period of four years. Richard Sutton, general manager at Horbury Property Services, said: "We have a proven track record in ceiling and partition renovation and installation and are really pleased we have been approved on this framework agreement. We're looking forward to working with Coventry City Council to enhance the interiors of its building stock." As well as ceiling and dry wall partitioning services, Horbury Property Services provides a full range of works, which can form part of planned maintenance programmes. This includes inspection, installation, repair and maintenance of fire doors, joinery works, fire stopping, sealing, fire compartmentation, fire alarm and emergency light testing, portable appliance testing, electrical testing and installation work, building fabric repairs as well as external cladding and render repairs.